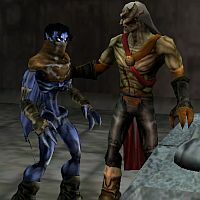 Raziel and Kain decided that any future was better the one they escaped, and dramatically re-wrote Nosgoth's history and destiny heedless of the timeline they would create. And for the undead would-be saviours of Nosgoth, things have just got a whole lot worse. As evil forces erupt to consume what little remains of New Nosgoth, new heroes have emerged from the darkest shadows to resist them. 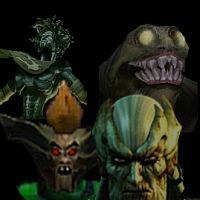 From Soul Reaver to Sluagh, those labelled as the monsters and parasites of the land are making a last desperate stand for the sake of everyone. Its time for the real Legacy to begin. 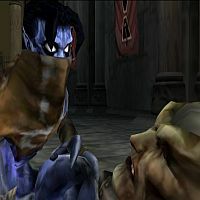 •Continue where the critically acclaimed Legacy of Kain franchise left off. 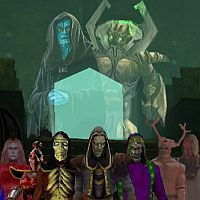 • Choose from seven playable characters: the vampire Kain, the wraith Raziel, the sluagh Frank, the.. thing Turelzevir, and three who are secret. Each has their own history and, with your help, perhaps their own destiny. • Acquire many unique skills, armaments and powers, each different depending on the character, and gain access to the forgotten and forbidden vaults, dungeons and realms of existence. • Survive as the Armies of the Dark Forces stop at nothing to destroy you! A large variation of foes to engage in combat: Vampires, Hylden, Demons, Sorcerers, Sluagh, Sarafan, Demons, Stormtroopers, Bosses, and one helluva Clone Army! • Available on, PS2, Gamecube, XBox, PC (Windows), PC (Linux), PS1, Dreamcast, Sega Saturn, Nintendo 64, Super Nintendo, Sega Genesis, Sega CD, Sega 32X, Nintendo Entertainment System, Sega Master System, Sega Game Gear, Atari Jaguar, Philips CDI, Gameboy Advance, Nintendo Gameboy, Sinclair ZX Spectrum, Commodore 64, Amiga 500, Atari ST, ZX81, BBC Microcomputer and HAL 9000.